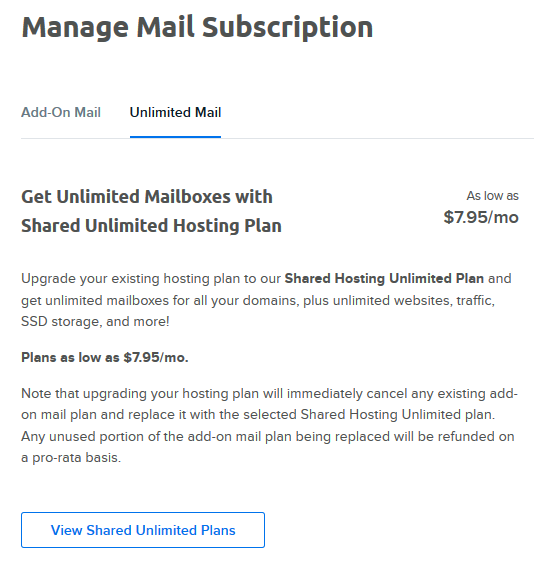 The paid email plan allows you to add email service to your Starter Shared hosting plan, or a domain registration only account. These types of accounts are originally not configured with email addresses. 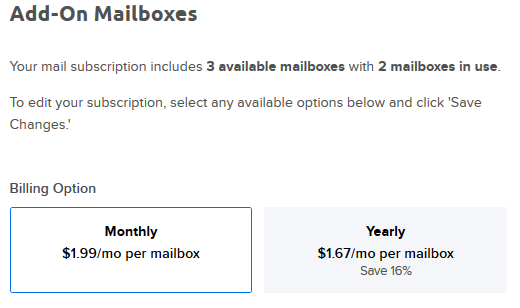 When you add the paid email plan to your account, you then have the ability to add up to 5 mailboxes. 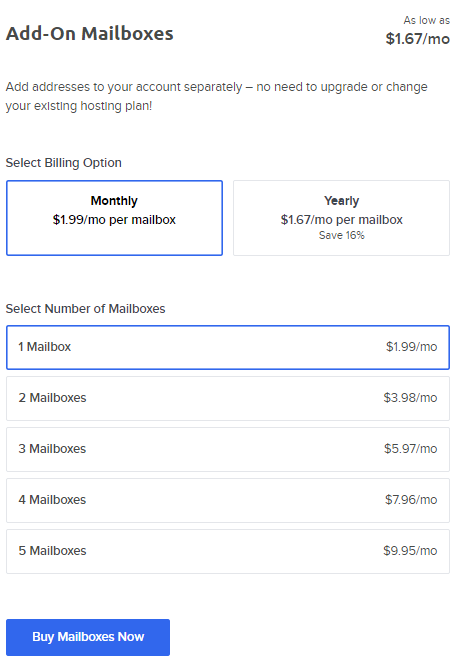 You can choose to have the email plan can billed monthly, or annually for up to 5 email addresses. Each email address allows up to 25GB of disk storage. You can see the usage in your panel next to your mailbox on the Manage Email page. Visit the Manage Email page. On the next page, select a Monthly or Yearly payment plan. Below, choose the number of mailboxes you wish to add. When finished, click the Buy Mailboxes Now button. You can view the details of your email plan on the Manage Account page. The following shows a plan with a single email added. When your paid email plan expires (or you cancel it) and the billing period expires, your email account will be disabled and deleted within 24 hours. On the top right, click the Manage Mail Subscription button. On the next page, enter the text DELETE into the text field, then click End Mail Subscription. Your plan will continue to function until the end date listed on this page. You can also cancel on the Manage Billing page by clicking the 'Edit' link under the ends column. If you choose 'End Today', you will be refunded any portion of the remaining time on your plan. 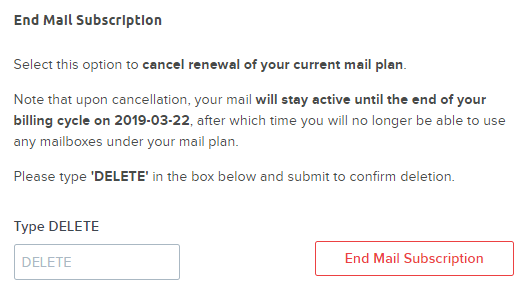 If you had previously canceled the plan on the Manage Email page, you can un-cancel it on the same page by clicking the Re-enable Paid Plan button. You can change your billing plan between Monthly and Yearly in your panel. Click the Save Changes button to save your new billing plan. You can downgrade your plan to the current number of email addresses in your panel. For example, if you have 3 addresses and want to downgrade to the 2 address plan, you must delete one of those addresses in your panel first. In this screenshot you can see the plan currently allows for 3 addresses, but only two are being used. 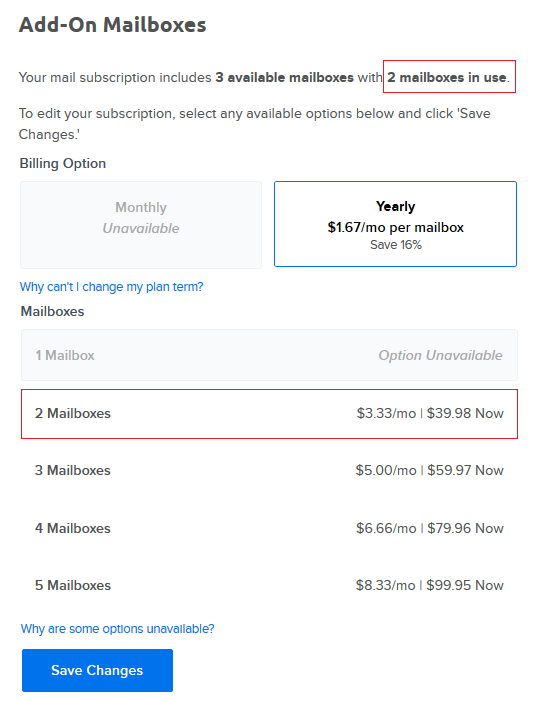 In this case, you can click the '2 Mailboxes' option to downgrade to the 2 Mailbox plan. Click Save Changes to save the new setting. Please note that you can only downgrade the number of email addresses to how many are currently set up in your panel. Click the 'Unlimited Mail' tab. Click the View Shared Unlimited Plans button. Choose which billing plan you prefer, then click Add Shared Hosting Plan. Article last updated April 15, 2019 20:07 PST.